Nines are an informal, yet common method of grading the purity of materials. Very fine precious metals such as platinum, gold and silver. Based on the system of millesimal fineness, a metal is said to be one nine or one nine fine if it is 900 fine, or 90% pure. 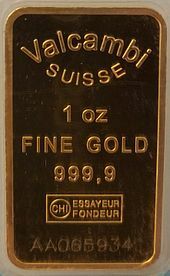 A metal that is 990 fine is then described as two nines fine and one that is 999 fine is described as three nines fine. Thus, nines are a logarithmic scale of purity for very fine precious metals. Similarly, percentages ending in a 5 have conventional names, traditionally the number of nines, then "five", so 999.5 fine (99.95% pure) is "three nines five", abbreviated 3N5. The nines scale is also sometimes used in describing the purity of bottled gases. The purity of gas is an indication of the amount of other gases it contains. A high purity refers to a low amount of other gases. Gases of higher purity are considered to be of better quality and are usually more expensive. The purity of a gas is generally expressed as a grade prefixed with the letter N giving the "number of nines" in the percentage or decimal fraction. For gasses, the number of nines is usually written after the letter N, rather than before it. An N2.0 gas is 99% pure, and 1% (by volume) impurities. An N6.0 gas is 99.9999% (six nines) pure, with 1 part per million (1 ppm) impurities. Intermediate values are formed using the common logarithm. For example, a gas which is 99.97% pure would be described as N3.5, since log10(0.03%) = −3.523. Nines are used in a similar manner to describe computer system availability. ^ McGachie, Richard O.; Bradley, Anne Grace (1981). "Precious metals". Precious metals. 4: 262. ^ PVD for Microelectronics: Sputter Desposition to Semiconductor Manufacturing. 1998. p. 387. ^ "Purity, Grades, and Concentration". BOCOnline.co.uk. Retrieved 22 January 2017. This page was last edited on 10 April 2019, at 09:57 (UTC).